During my first two or three tours I remember guides asking if I had been “here” before. Actually I have had guides that made up answers to things they did not know, but I did not use them again. Finding and keeping a good guide became an important part of planning a good tour. In the comments to follow I will limit myself to Israel. My first tour was a few weeks prior to the Six-Day War in 1967. The Old City of Jerusalem and the West Bank were still part of the Hashemite Kingdom of Jordan. We crossed from Jordan into Israel through the Mandelbaum Gate. Today the Grand Court and Olive Tree hotels stand nearby. After the war I continued to use Arab guides, all of whom would designate themselves as Christian (usually Lutheran or Greek Orthodox). My two favorite guides for many years were John and Anise. Both were knowledgeable in the events of Scripture and the places of these events. And both of them were good in handling a group. As these men reached the time of their retirement I had to scurry to locate other guides. One year all of the young Arab guides were called in for training by the Israelis. I had a Jewish young lady who had led only two tours prior to mine. I had to do a lot to help her with the group and the information. In the mid-80s I began to listen in on other guides when visiting various sites. I looked for someone who was knowledgeable in the Bible and the history of the sites. I wanted someone whose English would be understandable to visitors from the United States. I would introduce myself to guides I though might be good with my groups, and we would exchange cards. I needed someone who knew the land and the book, and who was informed in archaeological matters. In looking through old group photos I find two guides that begin to dominate. Eliemelech Ben Meir was my guide in 1994, but I see Yehuda Guy in some of the photos as late as 1998. I liked both men, and we worked together well I thought. They were both willing for me to make additional comments and explanations for the benefit of the group. In looking through old group photos, the first photo I find with Elie Ben Meir is a tour twenty years ago in May, 1994. Elie is helping me hold the tour banner. I see that Yehuda continued to guide some groups for a few years. Some years I had two tours to Israel. Eventually it was also Elie guiding some tours. Elie told me that he was introduced to me by my Arab guide Anise whose health was failing. 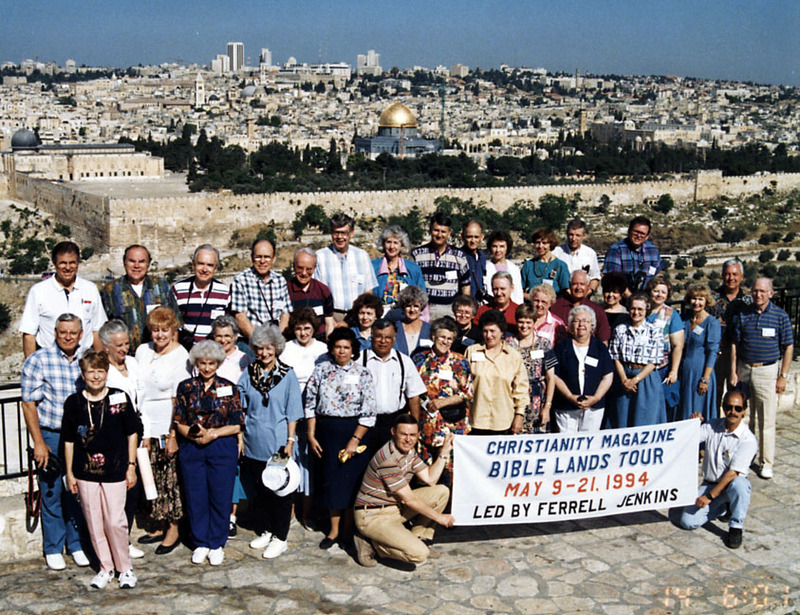 1994 Group with Elie Ben Meir. Elie was not what we might call a “religious” Jew. He told me that on his first visit to Israel he stayed at a “religious kibbutz,” but by the time that stay ended he decided he would not be “religious.” Elie and Maxine wanted their girls to learn the Jewish customs, but bacon from the Armenian butcher would not be uncommon on a weekend morning. Some of the members of my groups would ask me how could Elie know the Bible so well and not be a Christian. Elie’s family lived mostly in the Cleveland, Ohio, area. When he visited his mother or sister he would give me a call and talk a while. During the mid-2000s I told Elie about my mother who was suffering from Alzheimer’s Disease. Then the time came when Elie wanted to talk with me about a similar condition his mother was enduring. His trips to the USA became more frequent to assist his siblings in the care for her. I ferried items that Elie or his family needed from the USA to Israel − some special hair-care product for the girls or some beef jerky for the family. Even when I stayed over to visit sites I had not yet been to, Elie and one or both girls would come to the hotel and eat with me. Elie enjoyed Bluegrass Music. Sometimes, as we drove away from the Tel Aviv airport at the beginning of a new tour he would ask, “Does anyone in the group play Bluegrass?” He kept his guitar in the storage area under the bus so he could pick a little in the evening at the hotel. On Elie’s last trip to the USA he went to Cleveland to visit family. He left me a call on May 7, but I was already in Turkey by that time and did not receive the call until May 30. On the same day he sent me an Email with this heading and message. Adi Meyerson, bass | Spring ’14 Ensemble & Recital Series | New School Jazz – New York City – The New School. In case you happen to be in NY City! Hope you and Elizabeth are well! Elie was really on his way to NYC to hear his daughter perform. He had sent me other clippings about her. There has been a tragedy and Elie had a serious stroke on Sunday night and is now in hospital in Cleveland in critical condition. I was also receiving updates from Susan who was in touch with Elie’s sister Lynne in Cleveland. Elie had been having headaches for a few days when Lynne took him to the hospital. At some point he had a stroke. By May 18 the outlook did not seem good. Maxine sent Barry, John Barnett (I have not met John, but Elie always spoke highly of him), and me the following Email on May 24th. MEYERSON ELIE MELECH BEN MEIR (MALCOLM MEYERSON), beloved husband of Maxine (nee Rabinowitz). Loving father of Adi and Danya. Dear brother of Jay (Jacquie) Meyerson, David (Honey) Meir-Levi, Lynne (Jacob) Meckler. Cherished son of Evelynne and the late Bernard Meyerson. Graveside services will be held Sunday, May 25 at 11:30 a.m. at the Mt. Sinai Cemetery, (SOM Center and White Rd. ), Mayfield Village, OH. Family will receive friends at the residence of Jacquie and Aaron Meyerson,… SUNDAY FOLLOWING SERVICES UNTIL 8 P.M.
Elie had a number of qualities that were admirable. He was always ready to recommend the businesses of Moslems and Christians that he thought were honorable people. He warned his groups about those he thought were less than honorable. He always insisted on Fawzy (of Bethany) as the driver for my tours. Fawzy is an excellent driver whom I have known since the days of working with Anise. Elie knew woodworking. He spent time at that during those hard years of 2001-2005 when practically no tourists visited Israel. He did the electrical work for Yigael Shiloh in the City of David excavation. Elie had on his phone the personal numbers of acquaintances such as Sam Wolff (Gezer) and Eilat Mazar (City of David). 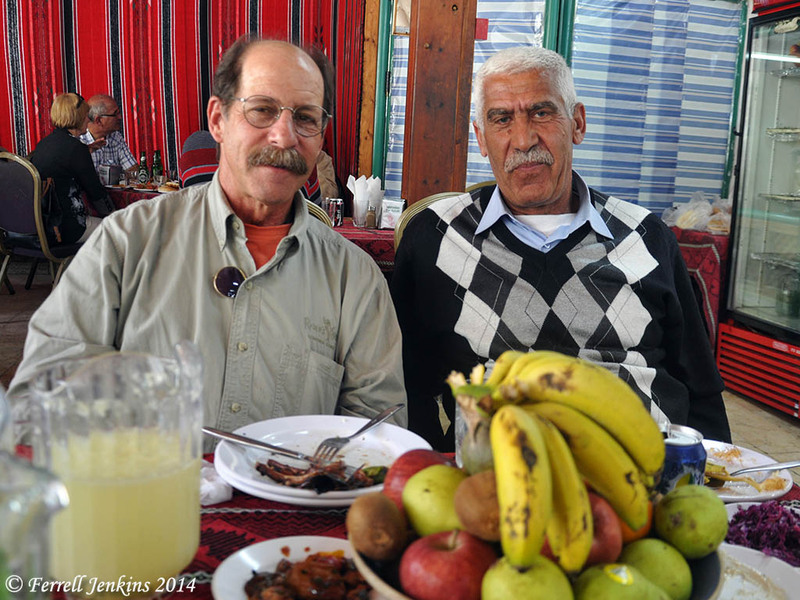 On my tour in 2013, Elie and Fawzy invited me to eat with them at Jericho. Here is the photo I made of them. You can see that Elie was a young man. I remember talking with him about his age and retirement, but I will not try to depend on my memory for that. Elie and Fawzy in Jericho. Photo by Ferrell Jenkins. I extend my deepest sympathy to Maxine, Adi, and Danya, whom I have met, and to other family members whom I have not met. I think the hundreds of persons who have spent about 10 days listening to Elie help turn the Bible places from black and white to color, one of his favorite expressions, will share my sentiment.